John Gruver was born on September 6, 1932. He was commissioned through the Air Force ROTC program on August 27, 1954, and went on active duty beginning October 9, 1954, when he entered Undergraduate Pilot Training. Lt Gruver was awarded his pilot wings in August 1955, and then completed Helicopter Pilot Training in March 1956, before serving as an SH-19 pilot with the 79th Air Rescue Squadron at Andersen AFB, Guam, from June 1956 to December 1958. He then served with the 4392nd air Support Group at Vandenberg AFB, California, from December 1958 to August 1964, when he transferred to the 341st Combat Support Group at Malmstrom AFB, Montana. Gruver was then assigned to the 606th Air Commando Squadron at Nakhon Phanom Royal Thai AFB, Thailand, from July 1966 to February 1967, and then with the 20th Helicopter Squadron at Nha Trang AB in the Republic of Vietnam from February to August 1967. He served as a UH-1F Iroquois instructor pilot with the 4408th Combat Crew Training Squadron at Eglin AFB, Florida, from August 1967 to February 1968, and then as a staff officer with the Special Air Warfare Center, also at Eglin, from February 1968 to March 1971. During this time, he served on Temporary Duty in Southeast Asia as a helicopter gunship instructor pilot to the Vietnamese Air Force in 1970. Col Gruver served as a liaison and commander’s aide at Hill AFB, Utah, from March 1971 to February 1973, and then as Aide to the Vice Commander at Air Force Logistics Command at Wright-Patterson AFB, Ohio, from February to October 1973. His next assignment was as Aide to the Commander of 8th Air Force at Barksdale AFB, Louisiana, from October 1973 to August 1975, followed by service as Commander of the 351st Security Police Group at Whiteman AFB, Missouri, from August 1975 to February 1978. 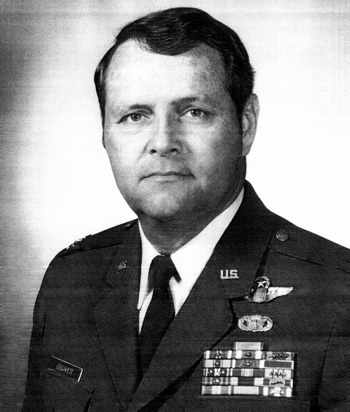 Col Gruver served as Commander of the 19th Security Police Squadron at Robins AFB, Georgia, from February 1978 to June 1980. 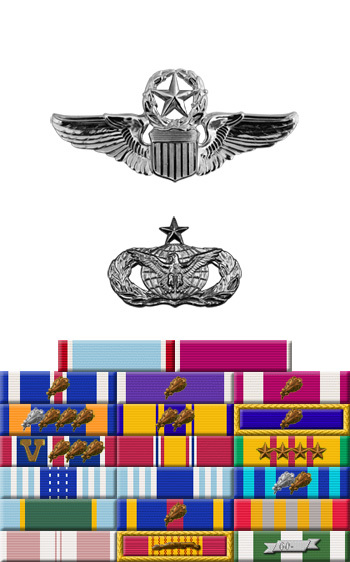 His final assignment was as Commander of the 86th Security Police Squadron and as Assistant Deputy Chief of Staff for Security Police with Headquarters U.S. Air Forces in Europe at Ramstein AB, West Germany, where he served from June 1980 until his retirement from the Air Force on October 31, 1984. The President of the United States takes pleasure in presenting the Air Force Cross to John C. Gruver, Captain, U.S. Air Force, for extraordinary heroism in military operations against an opposing armed force as aircraft commander of a UH-1F helicopter near Dak To, Republic of Vietnam, on 21 March 1967. On that date, Captain Gruver flew in support of friendly ground forces who were partially encircled in a bomb crater and unable to take evasive action because of their wounded members. He initially hovered in the hostile field of fire to suppress flames threatening a downed Army helicopter and then returned to evacuate the wounded. With the ground party freed to withdraw, Captain Gruver remained in the area to fly repeated fire suppressing passes in support of their movement. His determination and aggressive airmanship in the face of hostile resistance saved an aircraft from destruction and a highly trained team of American fighting men from capture or death. Through his extraordinary heroism, superb airmanship, and aggressiveness in the face of hostile forces, Captain Gruver reflected the highest credit upon himself and the United States Air Force.